Definition - What does Bharadvajasana mean? Bharadvajasana is a seated spinal twist asana and hip opener named after the Hindu guru Bharadvaja. It is also known in English as Bharadvaja's twist. The asana has several variations, but the most basic begins in dandasana (staff pose), a seated position with the legs extended in front. 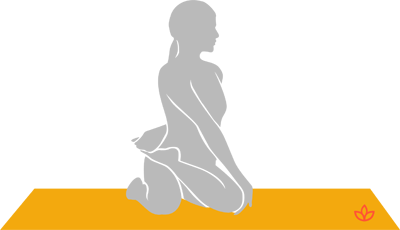 The weight is shifted to the right buttock, as the knees bend and the legs drop to the left. The left inner ankle should rest in the arch of the right foot. The upper torso then twists to the right as the right hand rests on the floor behind the body and the left hand rests palm up on the outer right thigh. Only then does the head turn to gaze over the right shoulder. To complete the asana, switch sides and repeat. Bharadvaja, for whom the asana is named, was one of the legendary “seven seers” (sapta rishis) and is known for having composed hymns that were later included in the ancient scriptures called the Vedas. The twisting motion of Bharadvajasana is believed to squeeze out tension and stress, as you would wring out a wet dishcloth. Practicing this asana, therefore, calms the mind and nervous system, restoring a sense of balance. Traditionally, Bharadvajasana is thought to open the muladhara (root) and anahata (heart) chakras. Opening the muladhara is grounding, providing a sense of security and safety, while opening anahata is associated with compassion, acceptance, self-esteem and love. Those with limited flexibility can place a blanket under the thighs. For someone with hip mobility problems, Bharadvajasana can be practiced from a seated position in a chair. A more advanced variation is Bharadvajasana B with one leg in padmasana (lotus pose) and the other leg in virasana (hero pose). This version should only be practiced by those with a lot of hip mobility.